The house of the Black Madonna is the host of the Czech Cubist Museum, exibiting works of Czech Cubism since its beginnings to the mid 50`s of the 20th century (E. Filla, J. Capek, B. Kubista). Besides the Czech Cubism exhibition situated on the 2nd and 3rd floor, you can also visit the short-term exhibitions set on the 4th floor of the building. On the 5th floor you will find the studios of lectures’ department. 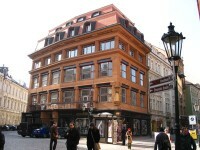 A historic Cubist café, the Grand Café Orient, was renovated and reopened in March 2005.